An artist’s impression of the proposed solar farm near Warwick. The University of Queensland is to build a 64MW solar farm to become the first major university in the world to offset 100 per cent of its electricity usage through its own renewable energy asset. The $125 million solar farm – to be built near Warwick on the state’s southern Downs region – will produce more than 154GWh a year, and adds to more than 6.3MW of solar on the rooftop of its St Lucia campus and at its research facility at Gatton and other sites. “This project makes a clear and bold statement about UQ’s commitment to leadership in renewables and demonstrates UQ is prepared to make a meaningful investment in creating a sustainable future,” vice-chancellor and President Professor Peter Høj said in a statement. UQ becomes the latest in a flurry of activity from big corporate customers who have elected to source the equivalent of all , or part, of their electricity through wind or solar. Mars Australia last week contracted 50MW of capacity from the proposed 200MW Kiamal solar farm to meet all the needs of its six Australian factories, while Nectar Farms is sourcing all the power for a new greenhouse facility near Stawell in Victoria from wind and storage. Sun Metals is commissioning a 124MW solar farm to meet one-third of the needs of its Townsville zinc refinery, Telstra is to source power from new wind and solar farms, while GFG Alliance is using the Numurkah solar farm to power the Laverton steelworks. All are turning to wind and solar because they are cheap and can slash their electricity costs. The cost of the Warwick solar farm, initially developed by Terrain Solar, is in the low $60s/MWh. However, UQ says it is not using LCOE as its key measure, preferring instead the NPV (nt present value) benefit of the solar scenario compared to business as usual. Using this calculation, it estimates the solar farm will more than offset its current and projected future annual electricity usage, which currently costs around $22 million a year, and will pay back the cost to UQ well within its lifetime. UQ will selling excess output on the merchant market, which will largely cover the cost of overnight imports. It plans to take some form of hedging to manage the risks of spot price exposure, but it will also look to use some of its own on-site storage facilities. These include 600kW/760kWh of lithium-ion battery storage at Gatton, a further 1MW/2MWh of batteries at St Lucia due to come online in early 2019, as well as energy storage in the form of a 3 million litre chilled water storage tank) at Gatton expected the next 12 months. This will enable UQ to use surplus energy during daylight hours to produce and store cooling energy equivalent to around 5 MWhe for use overnight. More storage is planned for excess generation, and could include batteries, pumped hydro, or hydrogen technologies. And UQ also has around 1MW of ‘fast’ (within 10 second) demand response and 3MW of ‘slower’ (within 10 minutes) demand response that can help manage its load. “Our behind the meter storage (electrical and thermal) as well as demand response will play a key role in helping to ‘firm’ the generation,” says Andrew Wilson, manager of energy and sustainability. UQ also plans to install several electric vehicle ‘fast chargers’, and the site will include a visitor’s centre, as well as research and teaching opportunities, helping to position the Southern Downs as a renewable energy hub. “Public engagement with the facility could be as varied as student field trips through to live data streaming that can be used for interactive market simulations,” Professor Høj said. 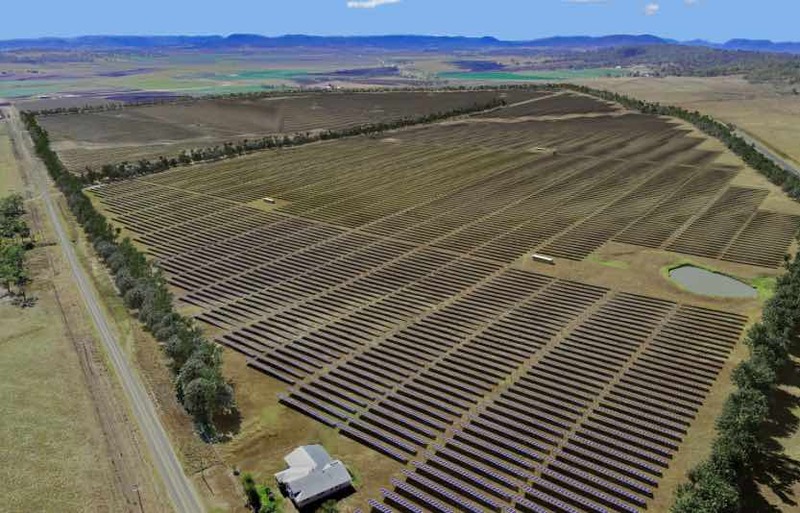 UQ will take ownership of the project from renewable energy developer Terrain Solar once construction starts, and will own and operate the plant over its expected life. It will feature single-axis tracking (SAT) technology, which will deliver a relatively ‘square’ power generation curve, well matched to UQ’s load shape, where the majority of activity occurs between 7am and 6pm each day.